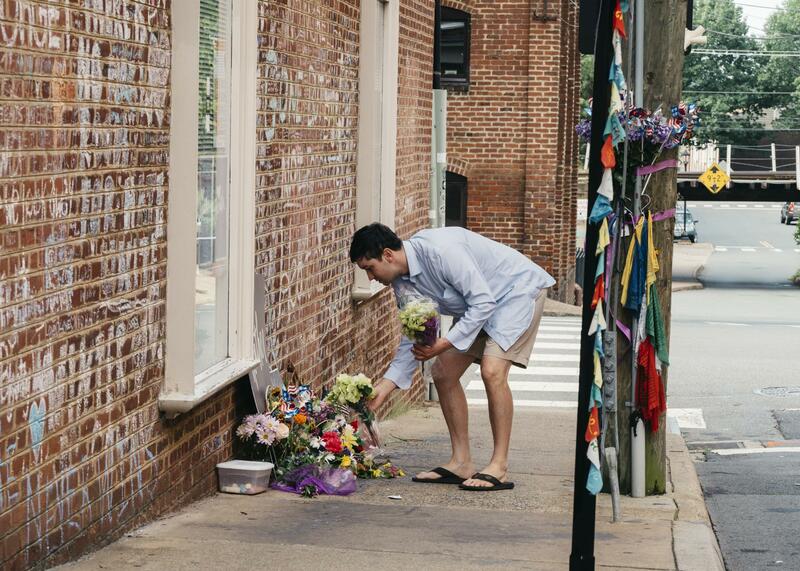 Peter Reijmers, 29, of Charlottesville, lays flowers at a memorial on 4th Street SE where Heather Heyer was killed last August. 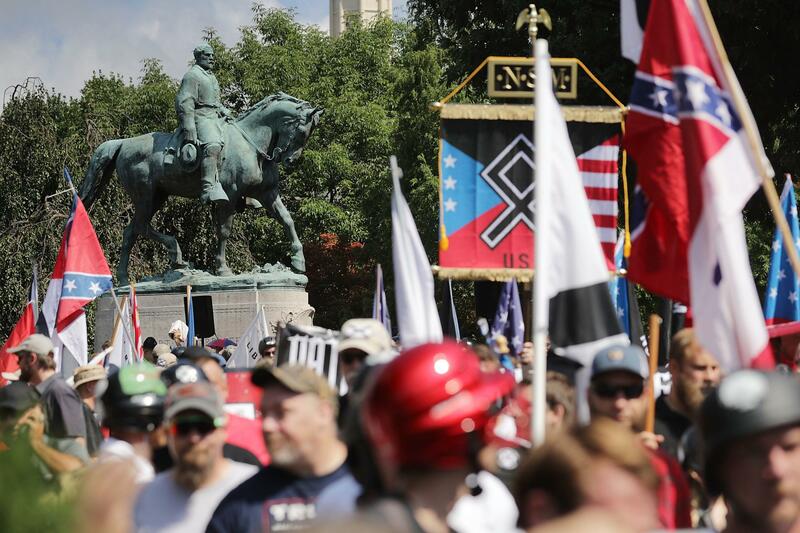 The statue of Confederate General Robert E. Lee stands behind a crowd of hundreds of white nationalists, neo-Nazis and members of the "alt-right" during the "Unite the Right" rally August 12, 2017 in Charlottesville, Va. Historic Downtown Charlottesville, Va. Since the violence last year, Charlottesville city government has been upended. Local authorities faced harsh criticism for not intervening and preventing the bloodshed. The police chief, city manager, city attorney and a spokesperson from last year are all gone. "As a community I honestly feel more divided than ever, which is sad," says Michael Coleman, a 30-year-old musician and sales manager. He's African-American, and spoke while standing by the statue of Confederate Gen. Robert E. Lee that white nationalists came to defend from removal last year. The space brings reflection. "How it's been such a source of hate and turmoil and conflict," Coleman says. NPR first met Coleman at a candlelight vigil on the U.Va. campus last year where he posed a provocative question: "Three-thousand people gathered with candles singing is beautiful, but are you going to engage yourself, are you going to talk to people tomorrow and the next day and next day?" "We're trying to piece together our city," says Frances Racette. She's part of the Charlottesville Friends Meeting — a Quaker Group — that hosted a prayer gathering in this downtown park, part of an effort by a local clergy collective to hold prayers twice a day all this week. After the Quaker meeting, retired coach and teacher Steve McNerney says there's a need for both personal work and institutional change. But he says not everybody is ready to embrace that, and would rather see things get "back to normal." "But what they're missing is it's kind of the normal that's the problem," says McNerney. 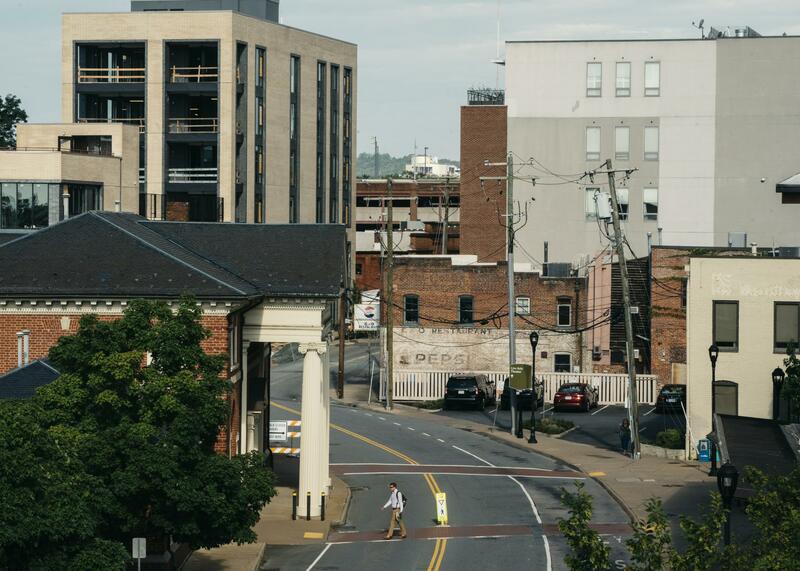 With a population of less than 50,000, Charlottesville prides itself on being a liberal college town and a top tourist destination. Now, she says the new narrative is coming from the nearly 20 percent of residents who are not white and have long experienced racial disparities. Charlottesville city council meetings have been marked by disruptions over the last year. David Pettit, a local attorney and a member of the downtown merchants' association, says finding common ground for discourse here is elusive. "Out of the events of last year has come a fair amount of pretty heated rhetoric relating to racial issues, socioeconomic disparity, housing, all of which are very legitimate issues," he says. "We're still not to the point of being able to coalesce around solutions." The ongoing turmoil has been disruptive to commerce. Joan Fenton has a gift shop and a women's clothing store on the downtown pedestrian mall. "Anger at the city — the anger at whatever historically has happened — comes out as disliking all business," she says. "And because we are downtown where City Hall is, we get tied into that even though it's not a real tie." The downtown area is where Heather Heyer was killed and several injured when a car rammed into a crowd of counterprotesters last year. This weekend the downtown will be closed to traffic and even pedestrian access will be controlled by security checkpoints. There's an uncertainty about what might happen during memorial events. The local organizer of last year's Unite the Right rally is planning a protest in Washington, D.C. Still, local people fear hate groups might show up in Charlottesville as well. They are grappling with what action to take if that happens. Woolfork, a professor at U.Va., says it's not surprising that Charlottesville is still struggling a year later. She says, after a large cultural catastrophe, there tends to be an unrealistic rush toward healing. "These things have to happen at a cellular level," she says. "And if we think about what the cellular history of Charlottesville is, that is a white supremacist history, and it will take a long time to recover from that." Authorities have already declared a state of emergency and say more than a thousand law enforcement officers will be deployed this weekend. Charlottesville, Va., is bracing for the anniversary of the white nationalist rally that shook the city nearly a year ago. It resulted in three deaths. A counterprotester was run over by a car, and two state troopers were killed in a helicopter crash. Many more people were injured. The tragedy also left an imprint on the town, forcing it to rethink a fraught racial history. NPR's Debbie Elliott reports. DEBBIE ELLIOTT, BYLINE: Charlottesville has long been known as a charming college town home to the University of Virginia and its founder Thomas Jefferson. After the events of August 12 last year, Charlottesville has become shorthand for racial strife. MICHAEL COLEMAN: As a community, I honestly feel more divided than ever, which is sad. ELLIOTT: Michael Coleman is a 30-year-old musician and sales manager. He's African-American and standing by the statue of Confederate General Robert E. Lee that white nationalists came to defend from removal last year. The space brings reflection. COLEMAN: How it's been such a source of hate and turmoil and conflict. ELLIOTT: I first met Coleman at a candlelight vigil on the UVA campus last year where he posed this provocative question. COLEMAN: Three thousand people gathered with candles singing is beautiful, but are you going to talk to people tomorrow and the next day and the next day and the next day? ELLIOTT: A year later, he says, it's been a struggle. COLEMAN: We've tried to have conversations about it. And it just helps you realize how difficult the conversation of race is. ELLIOTT: Coleman is channeling his energy in writing songs about the experience. Others are still trying to find reconciliation. UNIDENTIFIED CROWD: (Singing) Spirit of the living God fall afresh on me. ELLIOTT: A local clergy collective has held prayer gatherings in this downtown park twice a day all this week leading up to the anniversary. FRANCES RACETTE: Yeah, we're trying to piece together our city. ELLIOTT: Frances Racette is with the Charlottesville Friends Meeting, a Quaker group. RACETTE: We don't want to put back together what we had because what we had broke down because of a clear representation of the hate and racism that it was built on. ELLIOTT: Also at the Quaker meeting, retired coach and teacher Steve McNerney says there's a need for both personal work and institutional change. But he says everybody is not ready to embrace that. STEVE MCNERNEY: I think there are a major, major, major number of people who just want things to get back to normal. But what they're missing is it's kind of the normal that's the problem. ELLIOTT: Since the violence last year, Charlottesville city government has been upended. Local authorities faced harsh criticism for not intervening and preventing the bloodshed. The police chief, city manager, city attorney and a spokesperson from last year are all gone. And there's a new mayor who comes from an activist background - Nikuyah Walker. She welcomes the spotlight that has resulted from the Unite the Right rally picking Charlottesville. NIKUYAH WALKER: Everything that's been going on since Thomas Jefferson created this place needed to have the level of attention magnified on it. ELLIOTT: With a population of less than 50,000, Charlottesville prided itself on being a liberal college town and a top tourist destination. Now, she says, the new narrative is coming from the nearly 20 percent of residents who are not white and have long experienced racial disparities. WALKER: And all the things that are very ugly and very real that people face here every day - they didn't want to talk about those things. And last year changed that, the ability for people to walk into a room and demand that you tell the story they wanted told. ELLIOTT: But as that story is being amplified, some fear being drowned out of the conversation. Charlottesville City Council meetings have been marked by disruptions over the last year. David Pettit is a local attorney and a member of the downtown merchants' association. He says just like the national political climate, finding common ground for discourse here is elusive. DAVID PETTIT: Out of the events of last year has come a fair amount of pretty heated rhetoric relating to racial issues, socioeconomic disparity, housing, all of which are very legitimate issues. And we're still not to the point of being able to coalesce around solutions. ELLIOTT: The ongoing turmoil has been disruptive to commerce. Joan Fenton has a gift shop and a women's clothing store on the downtown pedestrian mall. JOAN FENTON: Their anger at the city, the anger at whatever historically has happened comes at a disliking all business. And because we are downtown where City Hall is, we get tied into that even though it's not a real tie. ELLIOTT: This area is where Heather Heyer was killed and dozens injured when a car rammed into a crowd of counterprotesters last year. This weekend, the downtown will be closed to traffic, and even pedestrian access will be controlled by security checkpoints. There's an uncertainty about what might happen during memorial events. The local organizer of last year's Unite the Right rally is planning a protest in Washington, D.C. Still, local people fear hate groups might show up in Charlottesville as well. And they're grappling with what action to take. LISA WOOLFORK: If it feels like freedom, do it. If it doesn't feel like freedom, don't do it. You know what I'm saying? ELLIOTT: Black Lives Matter organizer Lisa Woolfork offers advice to a college student at an event this week at the Jefferson School African-American Heritage Center. Woolfork, a professor at UVA, says it's not surprising that Charlottesville is still struggling a year later. She says after a large cultural catastrophe there tends to be an unrealistic rush toward healing. WOOLFORK: These things that have to happen at a cellular level - and if we think about what the cellular history of Charlottesville is, that is a white supremacist history. And it will take a long time to recover from that. ELLIOTT: Ahead of the anniversary groups have been training ordinary citizens on how to respond if another crisis erupts, whether acting as mediators to de-escalate violence or providing water and shade in the sweltering Southern summer. Authorities have already declared a state of emergency and say more than a thousand law enforcement officers will be deployed this weekend. Debbie Elliott, NPR News, Charlottesville, Va. Transcript provided by NPR, Copyright NPR.